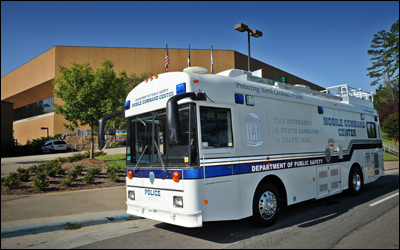 Carolina’s siren tests (conducted each semester) are much more than a way to make sure the emergency siren system and related communication methods work properly. They also give people on campus an opportunity to think about what they would do in an actual emergency. And that forethought can make a big difference in an emergency situation, said UNC Police Chief Jeff McCracken. McCracken also encouraged people to be familiar with the three types of notifications University officials use to inform the campus community about safety issues: Emergency Warnings, Timely Warnings and Informational Messages (see alertcarolina.unc.edu for details about each notification). He spoke with the Gazette about keeping the campus community safe. Why does the University have Alert Carolina? The real basis is safety, but there are other parts, too, which are based on federal requirements in the Clery Act for certain types of notification. We’ll issue an emergency warning when there’s an imminent threat to life on campus. A timely warning is required for serious crimes specified in the Clery Act when we think there’s still an existing threat to the campus. That was really the original version of the emergency communications policy, and we learned later that the campus community wanted more information about things that didn’t rise to the first two levels of notification. So now we have a third level, informational messages. Is the timeframe the same for all three notification levels? No, it depends on the situation. In the first two levels of the policy, we really want people to do something for their safety, but in the third level we aren’t asking people to do anything. It’s strictly to inform them about a situation on or near campus they may hear about and wonder about their safety.In an emergency, there’s an imminent threat of some type and we want people to seek shelter for their safety immediately. As soon as we become aware that there is a life-threatening situation, and it’s verified, we will activate the sirens and all the other communications that come with it. In a timely warning, we want to heighten people’s awareness and ask them to do something specific for their safety. The timeframe backs down a little bit while we investigate to get more information. The informational message is solely for information; there is no continuing threat to campus and no requirement about the time in which we send that notification. This level has the longest gap between the incident and when people are notified. That being said, we want to send these messages just as soon as we can – with correct information. That can take a while, especially if we’re working with another agency; that’s just the way it is. What goes into the decision-making process for sending an informational email? The decision-making process is most difficult in the area between an informational message and a timely warning. The key is whether we think there is a continuing danger to the campus.We gather all the information we can, which sometimes comes from another police agency, depending on where the incident has occurred. There are a lot of variables involved, but if we know that a situation has occurred – and not sending information about it will create a void that will be filled with incorrect information – we send an informational message. If we believe there’s a continuing threat, it rises to a timely warning. We want to give as much information to the community as possible so people can make decisions concerning their safety, but there are times we can’t release everything we know about a case. If we have certain information that is crucial to an ongoing investigation, we may not be able to include it in the message to campus because it will impede our ability to proceed with the investigation. Every situation is different, so to say there’s a fine line where we’re always going to do this or not going to do this just isn’t realistic. Is the emergency communications system effective? Yes, and it isn’t static. Any time there’s an emergency or major incident, we do an after-action review of that incident – whether it’s internal for a small incident or involving multiple agencies for a big incident. The communication protocols are one thing we review; if we can improve them, we revise them. The policy will naturally evolve over time. We rely a lot on technology for communicating to the campus, so as technology changes, the policy will change in conjunction with it. Is crime on or near campus increasing? Statistically, the crime rates have not increased on or near campus. There have been some incidents recently where firearms were discharged in the downtown area. In two cases, the firearm was not fired at anyone but was discharged into the air.Even so, part of the perception that there is an increase in crime in the Chapel Hill areas has to do with the fact that we’re doing a good job communicating with the community. Our current policy is much more proactive than it used to be; we push information to the public. That’s particularly true for the informational emails people now receive. In the past, they may not have known about those incidents. I think that leads to the perception that there is an increase in crime when actually there isn’t. One new step we’ve taken is to work with Chapel Hill police to increase foot patrols in the downtown area on weekend nights in targeted locations. We hope it will not only serve as a deterrent for people who would cause problems but also will help people feel safer in those areas. What can people do to promote their own safety and the safety of the campus community? I like to ask people to be the eyes for the department. We have 53 sworn law enforcement positions to police the campus, and obviously they cannot be everywhere at one time.First, we want people to be aware of their surroundings and report anything that is suspicious. Sometimes people are uncomfortable doing that because they think they’ll have to become personally involved if they call the police. That is not the case. If people see something or someone suspicious, they can call Public Safety and we will send an officer to investigate. The caller doesn’t have to meet with the officer or file a report. We’ll look into it, and take any appropriate action. We also want people to use some common safety tips, which are listed on the Alert Carolina page. Use the public transportation on campus, particularly at night. The University invests a lot of money in our public transportation process, and student fees support Point-to-Point. There aren’t many hours of the day when there isn’t some kind of transportation available. People should use the emergency phones located across campus. It doesn’t have to be an emergency. People can call if they see something that’s suspicious, and we’ll investigate. These phones are easy to use. Just push one button and it rings directly to our communications center. When should people call 911? What about reporting information? If there’s an emergency, people should call 911 so we can get someone there as quickly as possible. If someone has information about a crime that isn’t an emergency, they can call our non-emergency number (919-962-8100).They also can call the Chapel Hill-Carrboro-UNC Crime Stoppers tip line at 919-942-7515. Calls to Crime Stoppers are confidential and anonymous. Or, they can go to the Silent Witness online reporting form on the Public Safety website, bit.ly/14oOmkv. We’ll follow up information we get in any of those ways. What do you want people to know about safety at Carolina? Our campus is relatively safe. Are we immune to crime? Certainly not, but violent crime is a pretty rare occurrence on our campus. I think a lot of that is attributed to people who look out for their own safety and call us when they see things that don’t look right. The more people do that, the safer our campus will be.We are constantly looking for partners across campus to address crime and public safety concerns. If people want public safety programming we are prepared to make presentations on a number of topics, or we can tailor information to address a particular issue of interest. We want to help as much as we can. It’s really about building trust so when we send a notice to campus, people will say, ‘I might not know everything that’s going on but safety officials have the facts and they’re making decisions based on what they believe is best for the campus.’ If we can get to that point, it will be wonderful.